Openly gay professional soccer player Robbie Rogers recently did an interview with Out magazine and he shared what his life is like, now that he's co-parenting a baby with his partner, TV producer, Greg Berlanti. Rogers also spoke about how Pride events are so important, especially now since the Pulse Nightclub Massacre. Below is an excerpt from the interview. OUT: Why do you think it’s important we have Pride nights in mainstream sports? What’s the message you hope gets across? Robbie Rogers: I grew up thinking there wasn’t a place for me in sports, but obviously that’s because there aren’t out athletes. This is our third event and I think events like this show the younger generation that there’s a place for them in sports. Everyone is welcome and there’s a place for you in the stadium, there’s a place for you in professional sports and amateur sports. I want to see the people who show up not knowing it’s a Pride night and maybe are enlightened a bit. When I was at Dodger Stadium [for their Pride night on June 3], I think that happened for some people and I agree. I think that educational part is just as important. OUT: How have you all navigated this year’s Pride night in the wake of the Orlando tragedy? Robbie Rogers: That’s a good question. It’s more important, now more than ever, for the LGBT community to be public and to be present and show the world who we are. It’s somewhere we can all be together as a community and still have a good time but also send a message to the sports world and to young gay men and women that they can be whoever they want to be and know that they are loved regardless of whether they’re gay, straight, or whatever. For me, when I was thinking about the event, I was thinking how it’s a really great time to celebrate as gay men and women, celebrate each other and celebrate who we are. There were a lot of years when a night like this wasn’t possible and now changes are happening and there’s more for us to overcome, but we can celebrate and be happy and enjoy the night. OUT: Congrats on the addition of Caleb Gene to your family with Greg. You always hear that having a baby changes your life. What has your experience been? 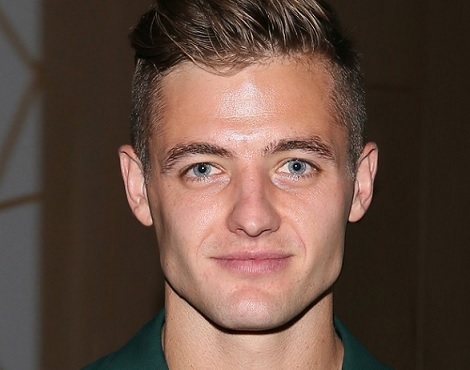 Robbie Rogers: It’s hard to explain. It’s just really such a gift and he brings so much to our lives. You hear that things change and you have to give up this and that, but I don’t feel like I’m giving up anything. I feel like I’m learning so much from him, like spending Sundays and family days and doing stuff with just the three of us has been so amazing. He’s been teaching us lessons and we’re excited since every week it’s something new. It’s really just one of the most amazing things for a couple or a person to go through. I feel really blessed and lucky, and the surgery gives me more time to spend with him.